Happy birthday to Sunny Studio Stamps! Wheeee! 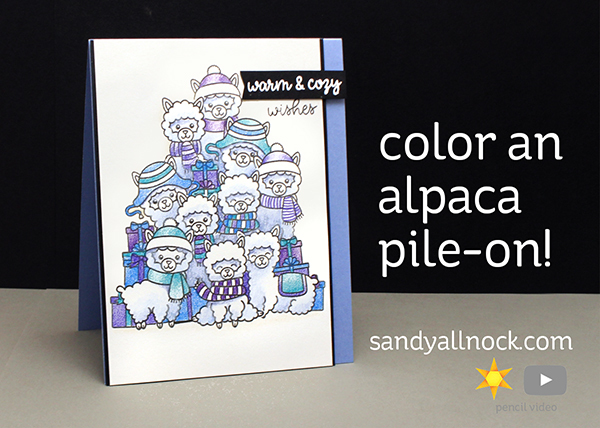 These little alpacas were so excited they decided to pile-on and get the whole gang together – ha! And as I look at it now – this could be a birthday OR a Christmas card, eh? Double duty! Watch the video below or click HERE to see it in HD on YouTube. Finishing the card meant adding strips of black behind the left and right sides, popping that whole panel on dimensional adhesive, then stamping “wishes” on the white, and “warm and cozy” on black with Versarmark then adding white embossing powder. Sunny Studios is offering 15% off on all retail orders using the code “CELEBRATE” through October 1st! And – Mendi has given each blog a $25 gift certificate to give away — for a total of $350 in prizes. Comment by Monday 11:59 pm PDT and they will announce all winners on the Sunny Studio blog on Friday, October 5. Hop on! 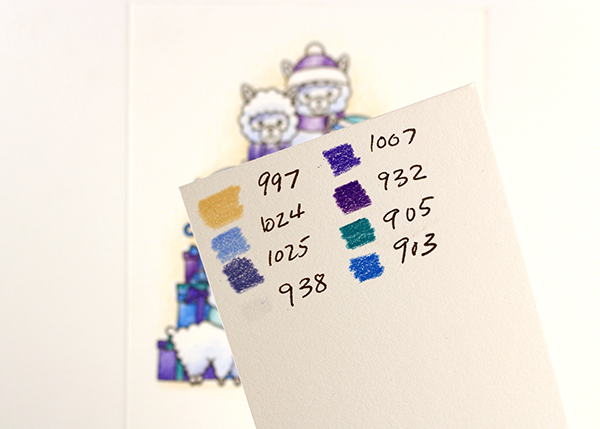 See all the new release stamps, paper, and dies HERE ! Just darling. Thanks for the inspiration!!! Oh, these little Alpaca’s are so cute. Really cute cards Sandy. 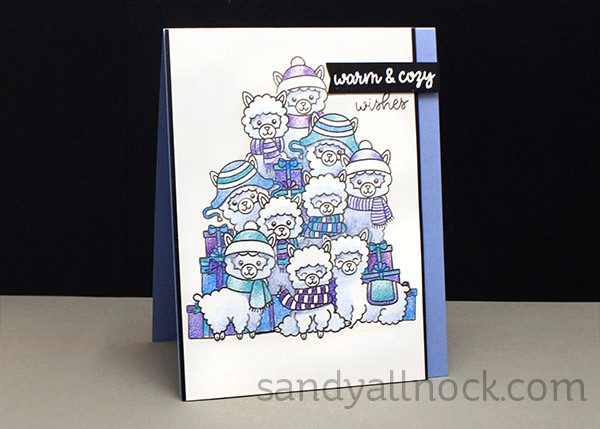 This grouping of alpacas is so fun, and I just love that you showed it in two different color themes! Love the monochromatic look of the card. So cute Sandy! We have alpacas and llamas living down the street and we LOVE them. They are so adorable as are these stamps! Love the llama pile! Great cards, this is a really cute stamp set!